Recorded as Herley and the more usual Hurley, this is an Anglo-Irish surname of two quite distinct identities. 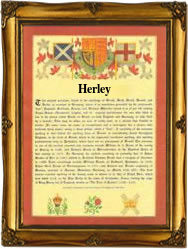 As an English surname it is of locational origin from places called Hurley in Berkshire and Warwickshire. Recorded as Herlei in the Domesday Book of 1086 for Berkshire, and as Hurlega in the Pipe Rolls of Warwickshire in 1180, the first element, in both cases, is the Old English pre 7th century word "hyrne", meaning a corner or bend, plus "leah", a wood or clearing; hence, "leah in a hyrne". The surname was first recorded in the early 13th Century, (see below). and other early recordings include Prior de Hurleye, of Oxfordshire, in 1273, and Richard de Hurleye, of Worcestershire, in 1327. The Irish nameholders are chiefly found in the province of Munster. They derive their name from either the English origin, or from either of two Old Gaelic patronymics O' hUirthile, meaning a descendant of Uirthile, an obsolete forename, and O' Muirthile, a byname containing the element "mur", meaning sea. Dermot O' Hurley (1519-1584), the Archbishop of Cashel, in County Tipperary, was a famous namebearer. The first recorded spelling of the family name is shown to be that of John de Herleia. This was dated 1210, in the Pipe Rolls of Wiltshire, during the reign of King John of England, 1199 - 1216. Throughout the centuries, surnames in every country have continued to "develop" often leading to astonishing variants of the original spelling.